On Monday Burger and Lobster are here to put your appetite to the ultimate test, with a never-ending serving of burgers! All those with an iron will and a limitless craving for a delicious burgers is encouraged to put on their battle-face for the ultimate unlimited shakedown. Order and eat as many Mayfair Burgers for Dh59! Flow, the homegrown healthy eating and hub in Jumeirah Emirates Towers, is supporting this year’s Dubai Fitness Challenge. Flow is reinforcing its commitment to inspire, educate and nourish the city’s bodies and minds with a special edition of its popular Flow Talk Series on October 22. The ‘Fitness Fuel’ Flow Talk will be led by a six-strong panel of nutrition and fitness gurus including Danae Mercer, one of the region’s leading health and fitness writers and a fitness influencer; Kamilla Omarzay, founder of healthy treat company The Snack Society which specialises in vegan cakes, desserts and healthy treats; Victoria Tipper, nutritionist and life coach; Carly Neave, fitness influencer and blogger who aims to inspire others to live a healthier life and strive towards their fitness goals; and Nadine Tayara, co-founder of KeepEATReal and Plosos, a nutrition and wellness consultancy and healthy food delivery platform. The talk will be moderated by TV presenter and inspirational wellness media personality, Uma Ghosh. One of the UAE’s first authentic Japanese restaurants at the Hyatt Regency Dubai, is celebrating its 31 anniversary on Tuesday. As part of the celebration Miyako will offer 31 per cent off on food and beverages during lunch and dinner hours for the whole week. Miyako has recently reinvented itself in a new avatar to continue serving authentic Japanese food. Dubai Outlet Mall is hosting ‘The Gift of Life’ blood donation drive in association with dubai blood donation centre. As part of its CSR joint initiatives towards building a healthy community, the event will be administered by Dubai Blood Donation Center, on Monday October 22nd. The mall encourages visitors, staff and tenants to join forces in this generous act of giving back to the community. Volunteers must be 16 years of age and above, weigh a minimum of 50kgs and be free from any contagious diseases such as cold, flu, cold sores or symptoms of infection. It is also advised to consume a well-balanced meal three hours prior to donating. Al Ghurair Centre, one of Dubai’s first shopping malls, recently unveiled Forno Uno, the latest addition to its F&B offerings. Located at the dining district, Forno Uno will serve authentic Italian cuisine. The farm to table Italian dishes include pasta, seafood, veal, pizza, freshly baked bread, and homemade desserts. The menu will also feature daily specials as well as family-style servings. The new restaurant will also feature a theatrical experience with its open kitchen setting that mixes old Italian methods combined with contemporary styles to bring together a fun culinary experience. Buddha-Bar at Grosvenor House will be hosting seven events, each one based on a different Buddha Bar venue, including Paris, Monte-Carlo, London, Russia, Budapest, Morocco and Greece. Each party will bring new music, new food and new signature beverages to the venue, inspired by the different Buddha-Bar locations. 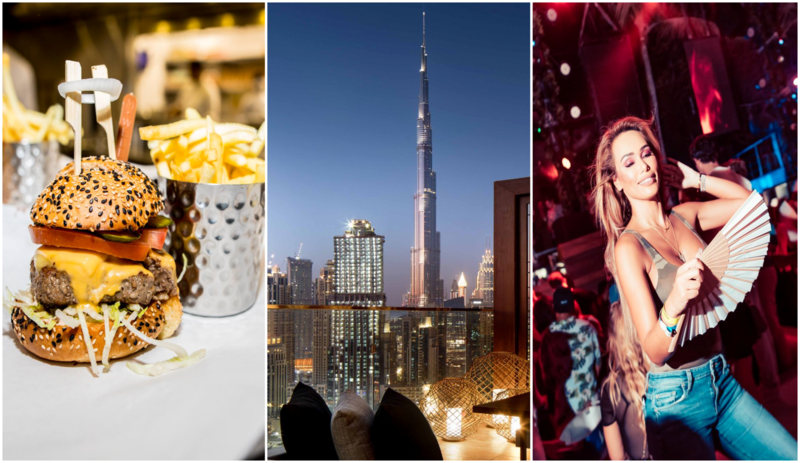 Taking place on the last Friday of every month for the next seven months, the first date in the calendar is Friday October 26, which will bring the first ever Buddha-Bar venue, Buddha-Bar Paris, to Dubai. DJ Ravin – direct from Paris – will be taking to the decks to get the party started, while Buddha-Bar’s very own Chef Zuzumo will be serving up some delicious Pan-Asian dishes straight from the menu of the iconic venue in France. As an iconic event in the Blue Marlin Ibiza UAE calendar, Burning Beach is a favorite UAE dress up occasion. This year it will take place on Friday October 26. The major lineup includes international names: DJ Tennis, Trikk, Hyenah and Henry Saiz & Band, alongside local favorites Frederick Stone, Michka, Aidin Karami, Mario Bazouri, Bachir Salloum, Sam Farsio and Maks. Festival goers will have upstairs and downstairs access, to enjoy an assortment of music, art, food and beverages. Make sure you arrive before 3pm to receive free entry. Every Tuesday from 8pm to 12am, ladies are invited for a relaxed evening with their favorite girls over a glass of grape or two, while they enjoy the view of the Dubai Creek. DJ Fatima will be hitting the decks with hits from the music charts. Friday: Brunch till you drop! Thai Kitchen at the Promenade is known for its authentic Thai cuisine. They will be hosting an a’la carte brunch every Friday. The native chefs will prepare each dish on the menu across three live kitchens, filling the restaurant with an ambience resembling the buzzing city of Bangkok.